Is it time to have the talk with your loved one about senior care? #1. Never leave them out of the decision-making process. As long as your loved one is capable of making decisions about their health and living situation, it’s imperative that you include them in the decision. Imagine if someone came to you and told you that they were moving you into an assisted living community without giving you any say in the matter. Chances are, you wouldn’t feel very good about it, so don’t put your loved one in this position. Listen to their opinion and give them a say in the care they receive; after all, it’s their life! #2. Start the conversation early. You don’t have to wait until your loved one absolutely needs care to start talking about care; in fact, if you wait until your loved one is not safe alone or can no longer wait to get care, it can make the conversation a lot tougher than it has to be. Having an open conversation will help to ease tension and make everyone more comfortable, and a key part of this is starting the conversation early and having the conversation often. A good way to start is by talking about your own long-term plans for care, and keeping the tone light and conversational. #3. Listen to your loved one’s concerns without judgement. The transition from living on your own, taking care of all of your own needs to moving into a facility or allowing someone to come into your home to take care of you is not an easy one. And, since many people associate senior care of all types with a loss of independence, it only makes the idea of having to rely on it even more difficult. Make it a point to listen fully to all of their concerns, and refrain from making any judgements or attempting to address them right away. Sometimes, people just need to vent a little without being given any answers or solutions, and if that’s what your loved one needs, let them vent! #4. Explain senior care can benefit them. Once you’ve listened to all of their concerns, it’s time to start talking about the many reasons why senior care is on the table. 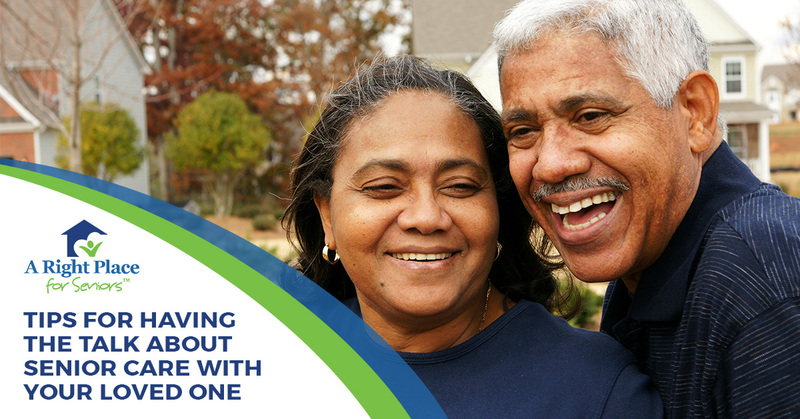 Talk to them about all of the ways that senior care can positively impact their lives, from companionship and social interactions to help with activities of daily living. Also, talk about the chores your loved one will no longer have to worry about on their own that they may not like so much, such as cleaning the kitchen, snaking hair out of the shower drain or pulling weeds from the garden. #5. Use past experience to explain the need for care. There’s a reason why you think it’s time to have the conversation about senior care — and it’s not “just because” — so be upfront with your loved one about why you think senior care is necessary. For example, if they have had a recent fall that they were able to recover from quickly, you could talk about how, for many older people, falling has led to a loss of independence. It’s important for your loved one to know how much you value them and their safety, and being honest about your specific concerns is an effective way to demonstrate that value. #6. Provide your loved one with a variety of senior care options. Unless your loved one requires a very specific type of senior care, like memory care, there are probably multiple options on the table as far as care is concerned. Don’t simply decide that an assisted living is the best choice without giving your loved one all of their options. There’s a possibility that your loved one would be perfectly happy with another senior care option that will meet their needs just as effectively, but you need to give them the chance to make that decision by providing them with all of their options. #8. Give them time to get used to the idea. Unless your loved one is no longer safe in their current living situation, there’s no reason to rush the process of talking about and deciding on senior care for your loved one. It can take a lot of time to get used to the idea of such a huge life change. And, change is always hard. However, once they have time to process the idea and learn about all of the pros and cons, they might be more open to it and willing to talk. #9. 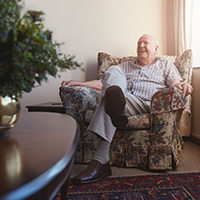 Correct any misconceptions they might have about senior care. When it comes to senior care, there are so many different myths and misconceptions out there that can make it seem much scarier than it actually is. Listen to your loved one’s concerns, and if they are based on misguided information, provide them with real data and facts. For example, if they believe that they will have to give up their independence, talk about all of the ways that senior care actually helps to promote independence. Or, if they believe that their new life will consist of parking themselves in front of a TV, share an activities calendar with them. #10. Take a tour, have a meal or participate in an activity. The unknown is always scary, no matter how old you are. If, for instance, assisted living is the best choice for your loved one, they might have the wrong idea about these kinds of facilities or the kind of care they provide. A good way to help to ease their fears and quell their concerns is to actually tour a facility. Many facilities even allow families to join them for a meal or an activity so that they can get a feel for what life is like there. Turn to A Right Place for Seniors for professional, no-cost senior placement services. Having the conversation about senior care is never easy for any of the parties involved, and we hope that these tips will help to make it easier on everyone. Once the conversation has been had, turn to the Senior Living Consultants at A Right Place for Seniors. We can help you sort through the many senior care options available to you to help you find the right one for your loved one, and from there, we can even help you find the right facility or agency. The best part is that our senior placement services are available at no cost to you! Contact a Senior Living Consultant near you today!